Are Factor ETFs the Key to Unlocking Your Portfolio’s Risk DNA? You are at:Home»ETF Strategist Channel»Are Factor ETFs the Key to Unlocking Your Portfolio’s Risk DNA? Correlation: The Missing Ingredient for Investors? Factor Investing: Short-Term Fad or Long-Term Shift? 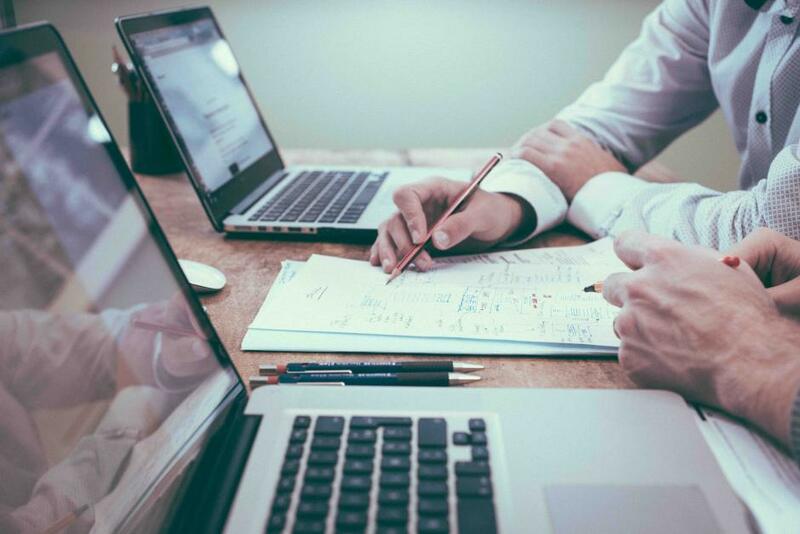 “Is factor investing a fad or long-term trend?” That is the question many advisors and investors have wrestled with since the introduction and proliferation of factor-based ETFs. These strategies are designed to capture exposure to one or more risk factors that may contribute to asset returns. There have been several academic studies on factors, and many have focused on a targeted selection, including beta, size, value, momentum, minimum volatility, quality, and dividend yield because of their risk/return characteristics relative to traditional market-capitalization-weighted benchmarks. Despite these advantages, adoption of factor-based ETFs remains in its infancy as many investors still question their application in investment portfolios. What risks can be measured and explained with factor investing? How should one think about the use of a factor ETF in a portfolio? How does this use of factor ETFs compare with market-cap-weighted ETFs? Risk management cuts to the heart of what investors care about – the maximization of wealth without too much uncertainty – and it is achieved through globally balanced portfolios. Factors and their associated quantitative models are extensions of that goal. Factors are intended to examine and explain the risk characteristics of an asset based on various macro and fundamental risks that drive returns. Factor sensitivities, or factor exposures as many practitioners call them, can then be utilized to aggregate a universe of assets into a common set of risk characteristics that can explain each asset’s volatility and correlation estimates. So, what can a factor-based framework show an investor that other risk frameworks might miss? Say for instance, we compared two global equity portfolios whose allocations and risk characteristics vary widely. The first portfolio is effectively weighted to target the risk characteristics of a broad global equity portfolio (in this example the MSCI All Country World Index IMI or ACWI IMI). The second is an equal-weighted portfolio of multiple equity asset classes. Based on each portfolio’s suggested allocations, this information could help explain the respective risk drivers. U.S. equities would make up around half of the global equity portfolio’s asset allocation mix, while the equal-weighted global equity portfolio would be more equally divided between domestic and international. International developed equities would account for the second largest allocation in the global portfolio because they’re riskier than U.S. equities, while this would not be the case in the equal-weighted portfolio. 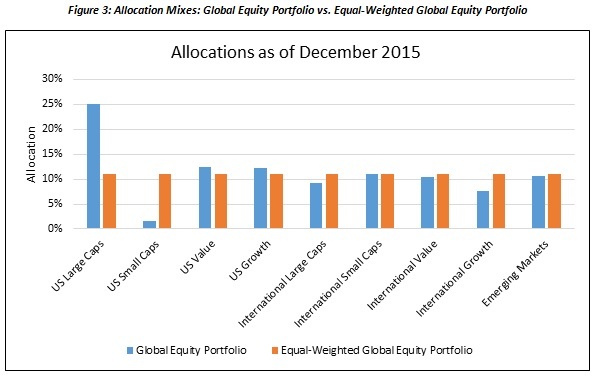 Both domestic and international small-caps would have a proportionally smaller allocation than their large-cap equivalents in the global equity portfolio, whereas they would be on more equal footing in the other. Finally, emerging markets would comprise the smallest amount of the global equity portfolio given their higher relative risk but would make up a greater portion of the equal-weighted portfolio. That lens provides a glimpse of where the risks may be, but the sketch is not complete. Once we examine both portfolios under the microscope of factors, the risk picture is a bit more surprising. 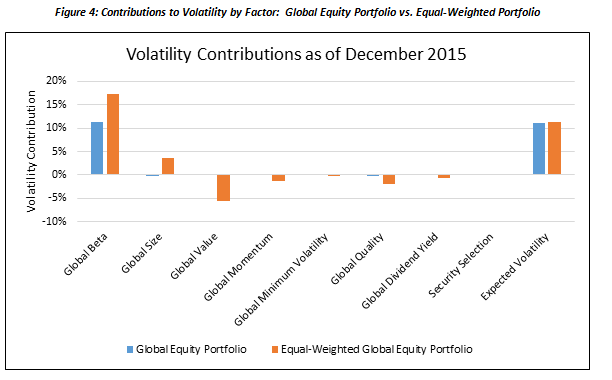 In the global portfolio, much of its expected volatility is attributable to beta and little is expected from all other factors. For the equal-weighted global equity portfolio, beta and size have meaningful contributions to the expected volatility and there is modest risk reduction in value, quality, and momentum factors. Each portfolio landed in the general vicinity of its expected risk, but the path based on underlying factor exposures is largely different.